The farm seeks to use, develop, and demonstrate sustainable energy technologies wherever possible. We consider it our responsibility both to reduce the environmental footprint of the food that we produce and to educate our students and our community on the possibilities for decreased consumption of non-renewable energy. 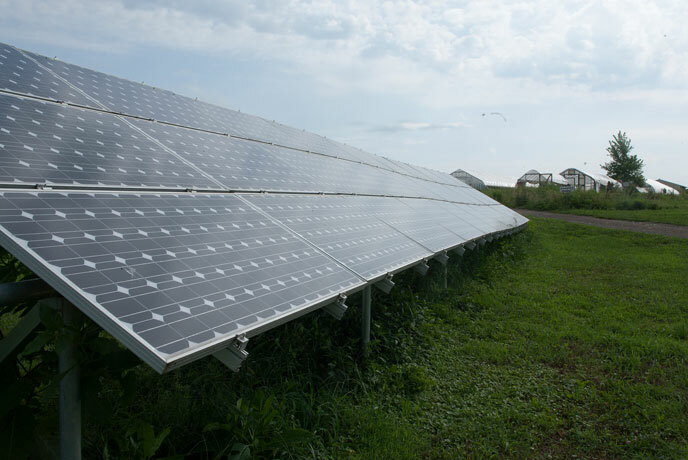 For electricity, we have turned to solar energy for many applications, with our goal being both to reduce our consumption of purchased energy from the region’s coal and nuclear plants, and to set up our farm as a demonstration site for several different solar technologies. The barn and farmhouse glean a portion of their electricity from two separate grid-tied photovoltaic systems. 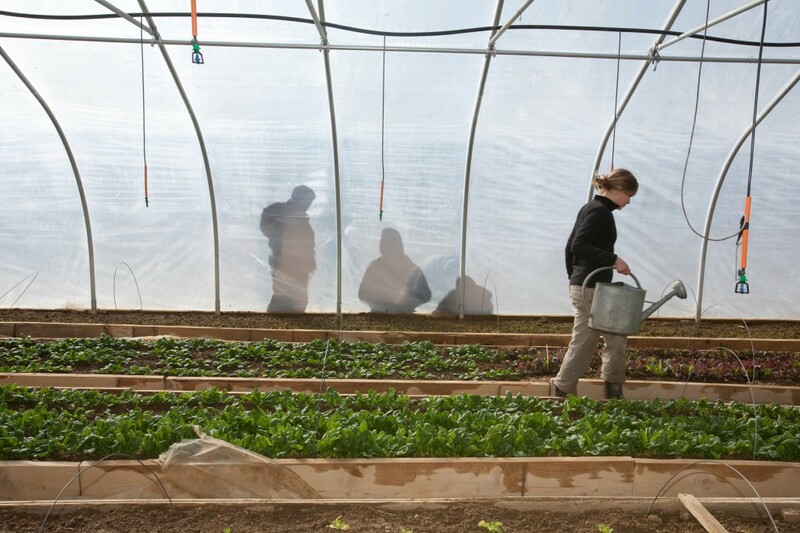 Seasonal interns who work and live at the farm are able to do so off the grid, experiencing a new dimension of sustainable living in their yurts. 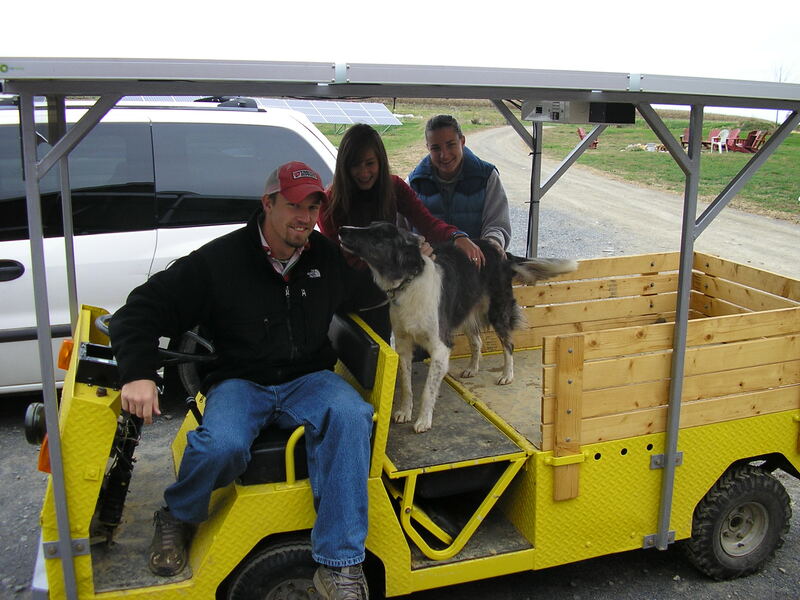 The largest greenhouse on the farm uses a solar water heating system for supplemental heat during the colder months of the year and farm staff members make good use of the Solar Wheeler golf cart that transports workers and harvests around the farm using the sun’s energy. Photovoltaic (solar electric, PV) systems are reliable, effective, and probably the easiest renewable energy technology to work with. Our PV systems produce clean, quiet, high quality power reliably, and we expect them to continue doing so with minimal maintenance for decades. 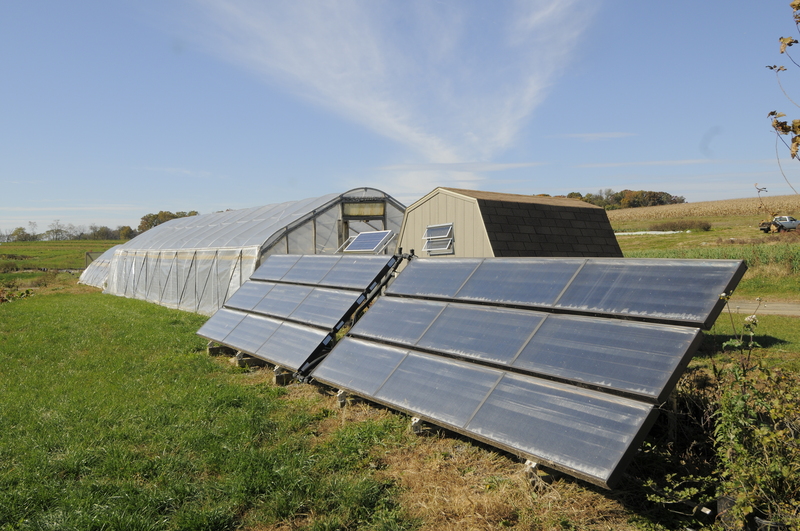 The farm’s large solar array provides a substantial portion of energy for the barn’s and greenhouses’ gross electricity consumption. 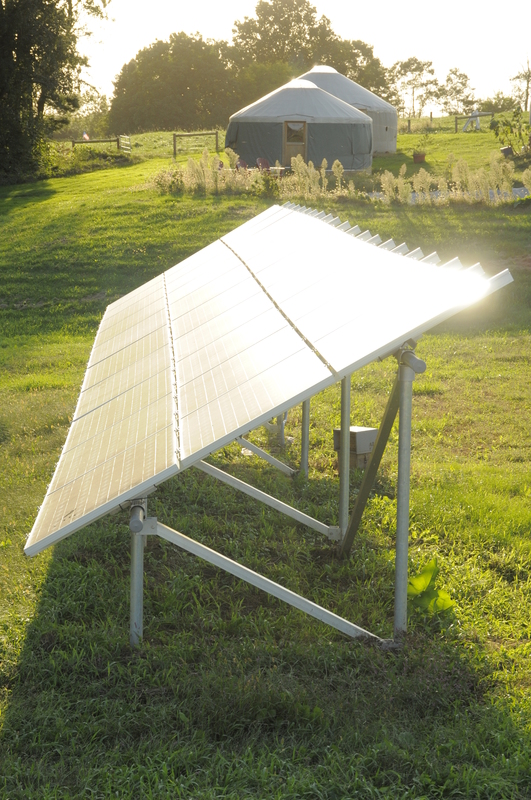 This grid-tied photovoltaic system is connected to the utility by means of an interactive inverter. The large solar array produces up to 5.25 kilowatts in full sun, resulting in about 30 kilowatt hours per day, which is enough to power the average home! Any excess energy produced by the solar array is sold to the utility company and, if necessary, bought back in the evening or on cloudy days. Innovation is alive and well at the Dickinson College Farm. 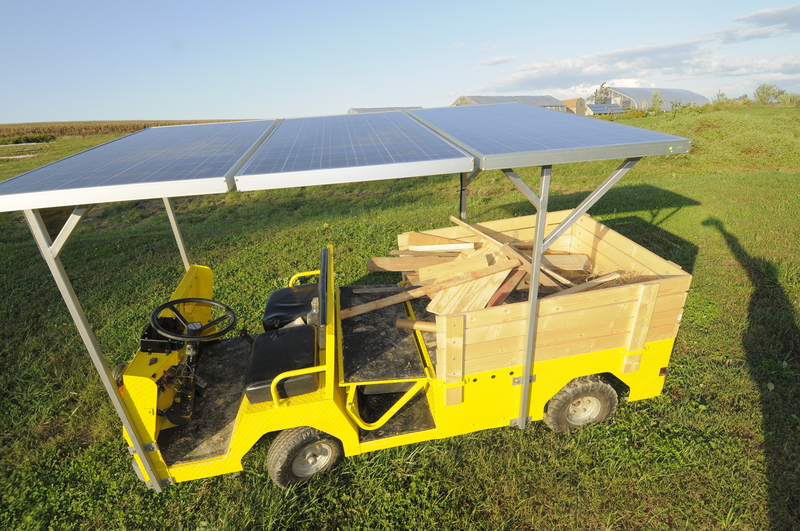 Thanks to the Solar Wheeler, transportation of harvest, farm equipment, and students around the farm is a whole lot easier. 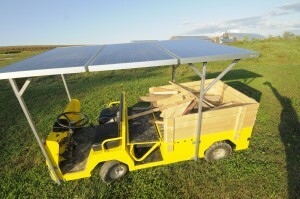 The Solar Wheeler is a refurbished Cushman heavy-duty electric cart equipped with three 165 watt solar panels and rechargeable batteries. 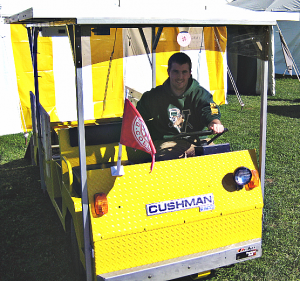 The Solar Wheeler is named for the student who built it as part of an independent research project: Sam Wheeler ’10. Wheeler interned with farm staff and Physics technician Rick Lindsey to create this enduring contribution to the farm. 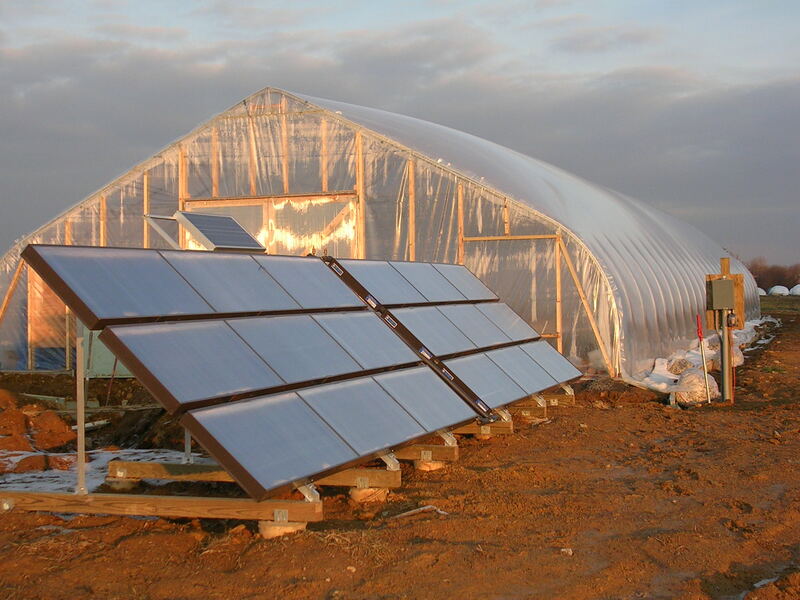 In 2007 the farm equipped its 3000 square foot greenhouse with a solar thermal system as an experimental approach to space heating. Six solar thermal panels collect heat from the sun, which is transferred to water in a 500 gallon heat storage / heat transfer tank inside the greenhouse. 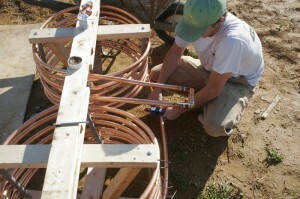 The solar collectors are connected with a copper coil heat exchanger in the storage tank via in a closed loop configuration. The solar loop is filled with glycol antifreeze for winter protection, which is heated by the sun in the collectors, then circulated through the storage tank where heat is given up for later use. 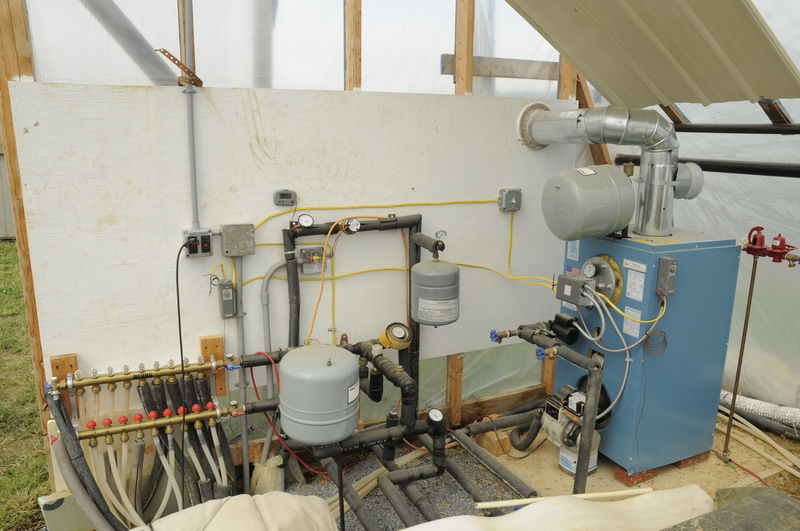 A second heat exchanger in the storage tank connects to plastic tubing buried one foot deep in each of the greenhouse beds. As the water runs through the tubes, it disperses heat to the soil and to the roots of the plants, in a manner similar to the in-floor radiant heating systems installed in some homes. The system is designed to heat the greenhouse more efficiently than conventional forced air systems. On cold, cloudy days, a biodiesel-run boiler heats the water tank via a third heat exchanger in place of the solar panels. In winter months, the increase in soil temperature resulting from the combined heating system speeds up the growth of cool season crops like spinach, salad greens, and kale. All of our greenhouses run east to west for maximum passive solar heating on the exposed southern sides. While greenhouses are most commonly heated with gas-fired forced air systems, research at Rutgers University has shown that heating the root zone via in-floor radiant heat is significantly more energy efficient and provides benefits for disease management as well. Solar heating with flat-plate collectors is a proven technology that is widely practiced in residential and commercial buildings, resulting in significant energy and cost savings. 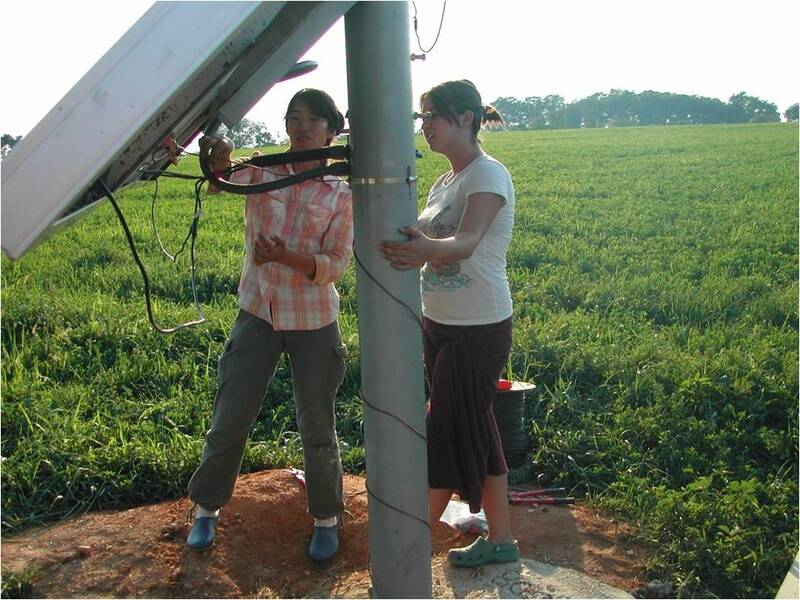 Use of solar heated water to warm the root zone in greenhouses is as of yet an uncommon practice that may significantly reduce fossil energy inputs to the agricultural system. 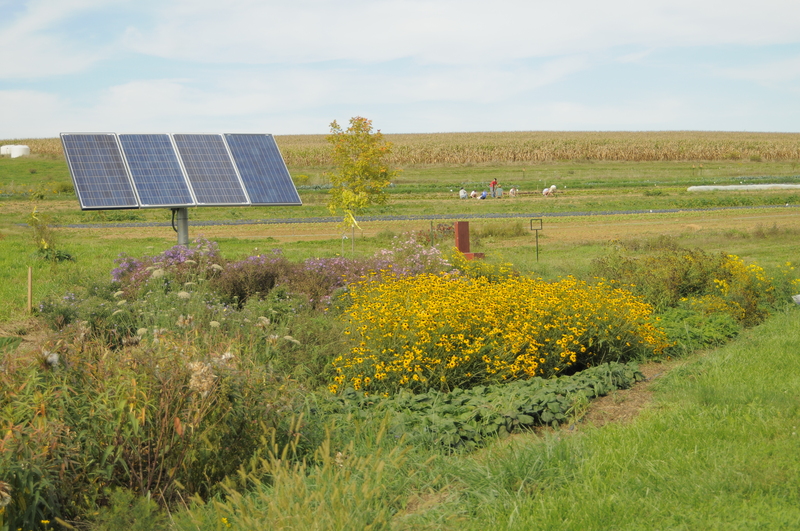 This experimental venture was supported by a grant from the Innovation Transfer Network of Central PA, and built in collaboration with Solar Tech of PA and Vertis Bream. The smallest stand-alone solar electric system is “Solar Steve,” a fully mobile 60 watt PV panel and 12 volt gel-cell battery equipped with a charge controller. 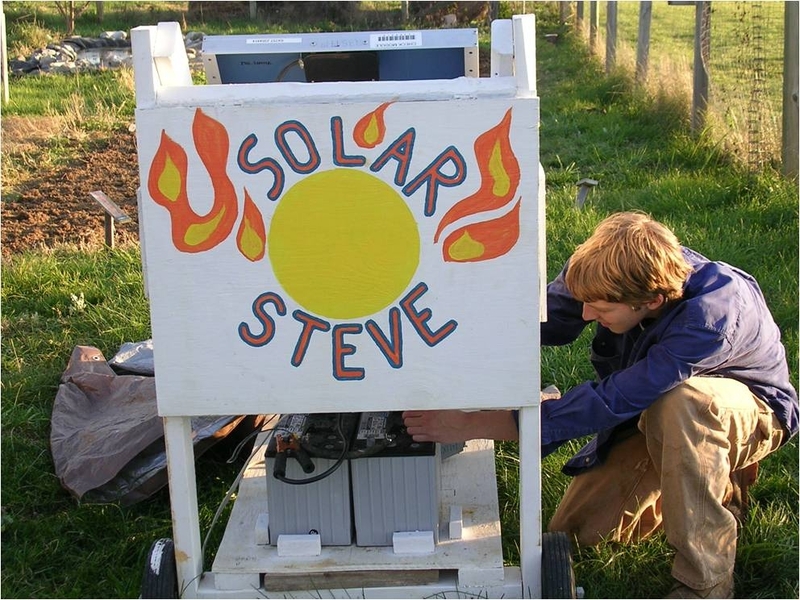 Solar Steve is used for powering electrical fences at the farm and for educational amusement, such as blending smoothies! 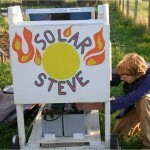 Currently Solar Steve is parked near the experimental biogas system, where his battery is used to power a slurry pump. The round cabin-like structures near the pond, called yurts, provide housing for our resident interns. Electricity for the yurts comes from an 800 watt pole-mounted solar array nearby. This system is battery based, meaning it is not connected to the utility in any way. This modest system provides all of the electricity needs for residents’ lighting, computers, entertainment, and other basics. Interns cook and shower in quarters built in the modified garage. 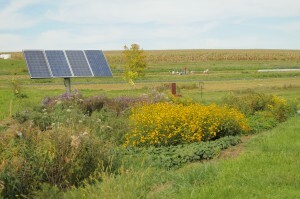 Energy for these needs comes from the farm house’s solar system.